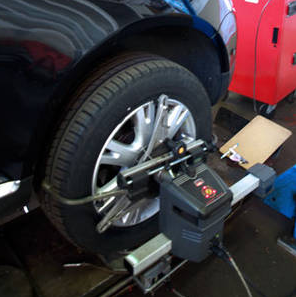 SNS Automotive Repair uses computerized alignment equipment to measure all alignment angles on your vehicle. We then make adjustments to ensure your car is performing as efficiently as possible. SNS Automotive Repair now offers precision total wheel alignment, utilizing a state-of-the-art computerized alignment system. The system applies microprocessor-based technology, along with laser accuracy, for precise alignment of cars, heavy trucks, and trailers. Does your vehicle have any of these symptoms: irregularly worn tires or “crooked” steering wheel, pulling to one side? Pay attention to your vehicle, it is trying to tell you something. It needs to be aligned. Not only will we align your vehicle, we will look it over first for worn or damaged suspension components such as: worn kingpins, worn or loose wheel bearings, loose tie rod ends, worn spring pins and bushings, worn tracking arm/walking beam and torque arm bushings and advise you if there is a problem. Stop in today for all of your alignment needs!